Do some dive sites leave you stuck on the boat because the depth limits are beyond your level of experience? Do you want to extent your depth limits to beyond the 30 meter range? 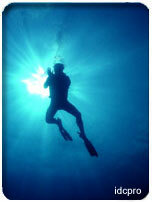 Do you want to learn how to conduct deep dives safely? If so, then the PADI Deep Diver Specialty course is just what you need. The Deep Diver Specialty course offers you the opportunity of a lifetime - going deep to see thing others can only dream about. The purpose of the PADI Deep Diver Specialty Course is to familiarize you with the skills, knowledge, planning, organization, procedures, techniques, problems, hazards and enjoyment of conducting dives between the depths of 18 meters/60 feet and 39.5 meters/130 feet. During the course you will learn all about the procedures and specialized safety equipment especially important to deep diving. You will learn about how depth affects the human body, and what special considerations need to be addressed. You will go into more depth on decompression theory and the affects of narcosis. Do you know how a recompression chamber works? Well this is covered as part of the course. There is also a review of the PADI Recreational Dive Planner and Dive Computers, as well as practical training exercises during the open water dives. This course is a must for all serious divers looking to extend their depth range and their experience. Specialties include: click on the links on the right menu for a profile of the courses available.